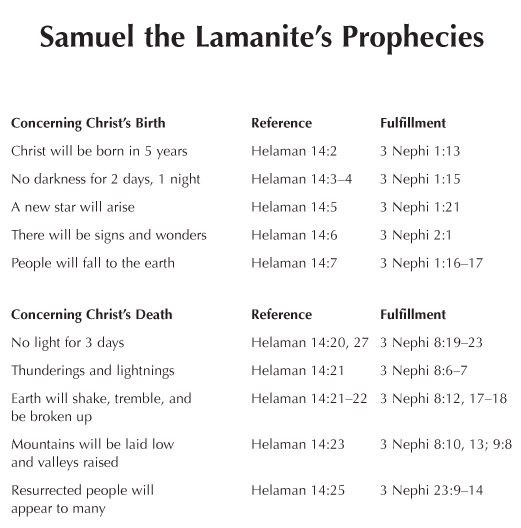 As the time neared for Samuel the Lamanite's prophecies to be fulfilled, Nephi3 witnessed the growing skepticism of the people concerning the predicted earthly advent of Jesus Christ. This skepticism led to the persecution of those who believed in Christ's coming by those who felt the time of his birth had already passed. These skeptics threatened to kill the believers unless the sign of Christ's birth appeared before a certain date. Possibly because the very lives of the believers depended on the fulfillment of those prophecies, Nephi paid careful attention to documenting their exact fulfillment. Nephi also tracked Samuel's prophecies concerning Christ's death and their fulfillment.